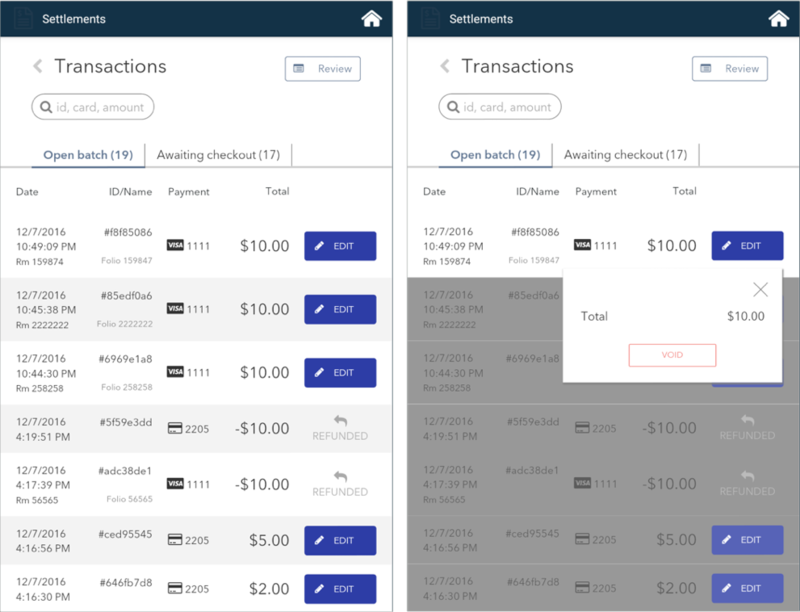 The Settlements App will allow you to review summary information about the current open settlement batch, review detailed transaction information for records in the current batch, process transaction actions such as Void, and submit the settlement for batch close. 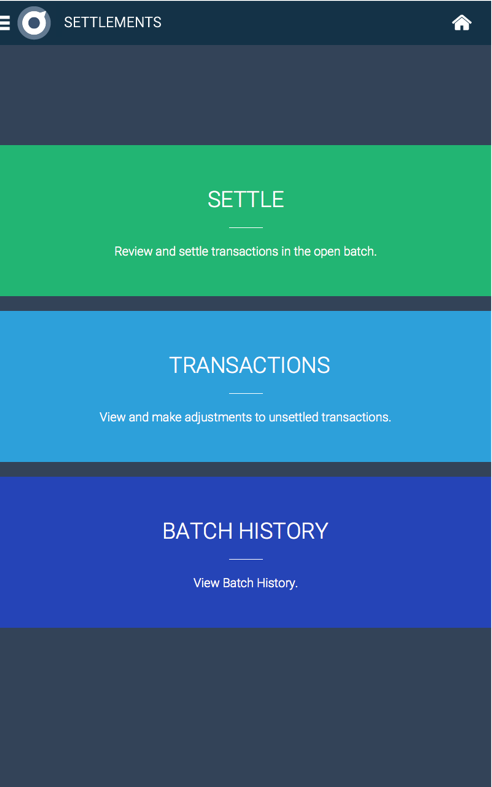 "Settle" allows you to review a Settlement Summary of transactions in the Open Batch. 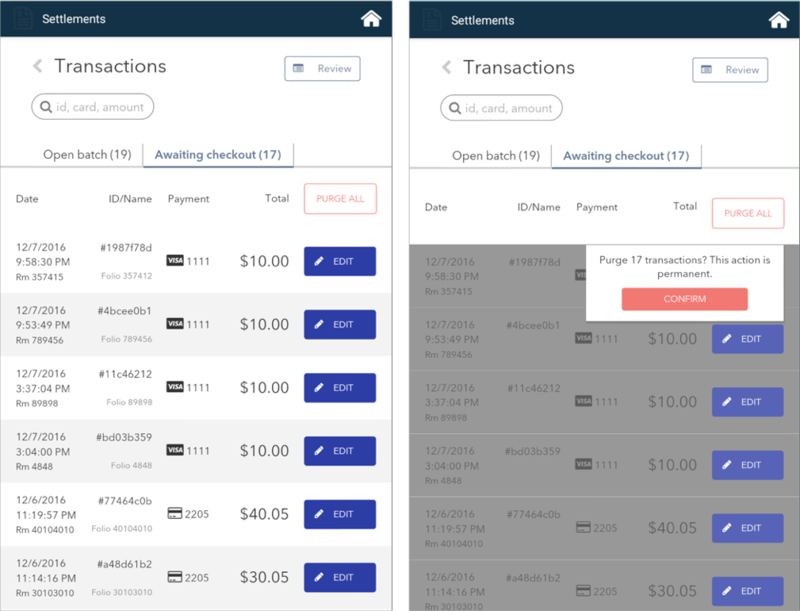 "Transactions" allows you to view a detailed list of transactions in the Open Batch and/or Awaiting Checkout transactions. "Batch History" allows you to view previously generated Settlement Reports. In addition, you may access Settlements via the web when you log into your poynt.net merchant account. The same functionality that is in the Settlements App on the terminal is also available on the web. You may also access the same Settlements Batch History reports on web as well. If you have any Transactions Pending Review (such as Check-In’s which have not yet Checked-Out), you will see a button option to Review Transactions. After reviewing the summary and/or Transaction details, and if you are ready, then tap on Settle Open Batch. Tapping on Review Transactions will take you to a detailed list of transactions in your Open Batch. 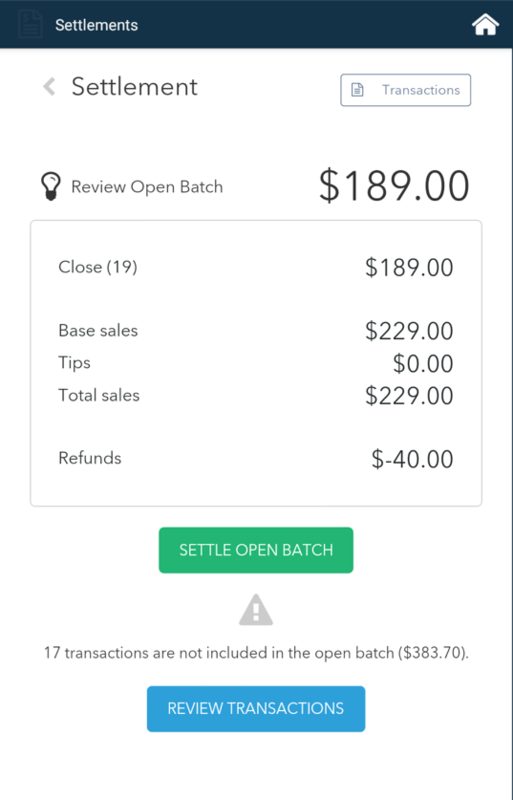 The tab for Open Batch shows you all transactions (eg Checked-out, Quick Stays, Sale, Refund) which are currently in the Open Settlement Batch. If you need to Edit a transaction in order to Void, tap on the Edit button. Note: Captured transactions, such as Check-outs, Quick Stays, Sale transactions, can be voided as long as they have not yet been settled. You can also toggle or tap on the tab heading for Awaiting Checkout to review a list of Checked-In stay transactions which have not yet Checked-Out. See next section. When you have completed your transaction review and are ready to Settle, tap on Review button to go back to Summary screen and tap Settle Open Batch. The tab for Awaiting Checkout shows you all Checked-In stay transactions which have not yet Checked-Out. This tab will allow you to manage any old or “stale” Check-In’s which might need to be Voided if they have not been processed in a while. You may individually Void each record by tapping on the Edit button. In addition, if you want to” Void All” old Check-In records in this tab, you may use the Purge All button. You will then see a pop-up box confirming whether you want to Purge (or Void) All transactions in the Awaiting Checkout tab. You can also toggle back to the Open Batch tab. After you perform Settle Open Batch, you will see the Settlement Report Summary. You may also tap on Batch History which will take you to a detailed list of Settlement Reports for past batches. You’ll see a list of generated Settlement Reports with the most recently settled batch at the top. You can access the same Settlement reports by logging into your poynt.net account > Sales & Reports > Reports for the report in html, pdf, or excel formats. The Settlement Report shows you a summary of what Sales by card type settled, as well as Tip and Refund totals. How to process a payment using NFC Payment Mode (Apple or Android Pay) on the device?